A.R.E. takes pride in the fact that they have the best and most experienced truck accessory dealers around. A.R.E has many options available for your vehicle fiberglass tonneau covers, camper shells and aluminum DCU for your commercial upfit. The Z Series truck cap is engineered to provide the best fit and finish possible. The styling, frameless doors and windows, and attention to details make the Z-Series the perfect choice for any truck. And the optional keyless entry system is a great final touch. The V Series offers traditional styling with smooth, clean lines, and many different options to meet your needs. This model is the right choice for customers who want quality and function, without breaking the bank. The side tool box option is a great addition for any contractor. The DCU with over 200 variations to choose from, you can create the perfect cap to fit your work needs. Our rugged, fully welded frame construction offers years of durable service, no matter what the weather or job. When it comes to protecting your cargo from theft and the elements, you need a tonneau cover you can trust. 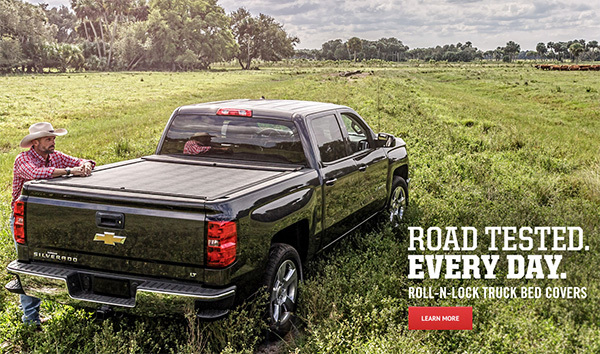 Roll-N-Lock® is the most rugged, versatile, and secure truck bed cover in the world. From its retractable function, which permits opening or closing in literally seconds, to its rigid, vinyl-over-aluminum laminated construction, this hybrid cover offers everything other tonneau covers do not. You’ll have no snaps to manipulate, no roll or bundle to lash down or stow, no cross bars to negotiate, no fabric shrinkage to struggle with, no folding or solid hinged covers to combat, and – best of all – no worries about the security of your cargo. The Roll-N-Lock retractable truck bed cover – by far, the most advanced tonneau cover made. The BAKFlip® Tonneau Cover / Truck Bed Cover is the NEWEST GENERATION of hard, folding multi-panel tonneau covers! Enjoy all the security of a locking hard tonneau cover and have instant access to your entire truck bed! The innovative BAKFlip cover folds all the way forward and up against the truck's rear cab (rear window) giving you access to all of your truck bed without removing the cover! The BAKFlip is also easily removable with 2 fastening knobs and the average covers weighs only 40 lbs when removed! PLUS - The BAKFlip DOES NOT INTERFERE with stakehole pockets on your truck, so it works perfectly with side rails, heachache racks, tie downs, overhead truck racks, etc! Don't forget to look at our new Rolling Tonneau Cover (Roll-X), and our industry leading Retractable Cover (RollBAK). Many more models available in store!